the real-time control of EUS-guided fine needle aspiration (EUS-FNA) biopsy and other interventional procedures. 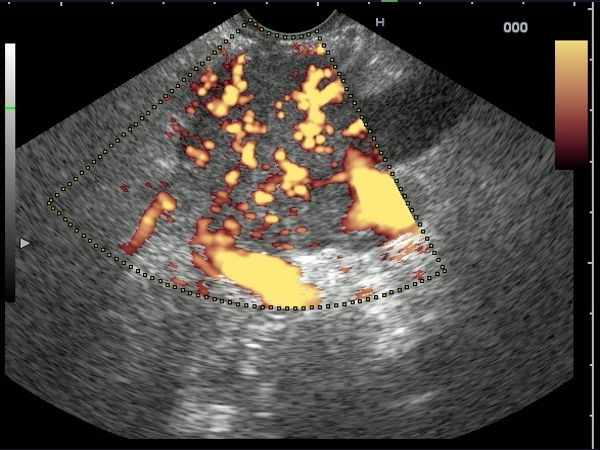 Recent EUS-directed or EUS-assisted techniques are continuously expanding the spectrum of EUS applications. Most of the interventional procedures are further shown in the linear EUS atlas. The EUS examinations were performed in the Gastroenterology Department of the University of Medicine and Pharmacy Craiova, ROMANIA, using a high resolution digital linear endoscopic ultrasound system, as well as DVD recording and archiving of cases. 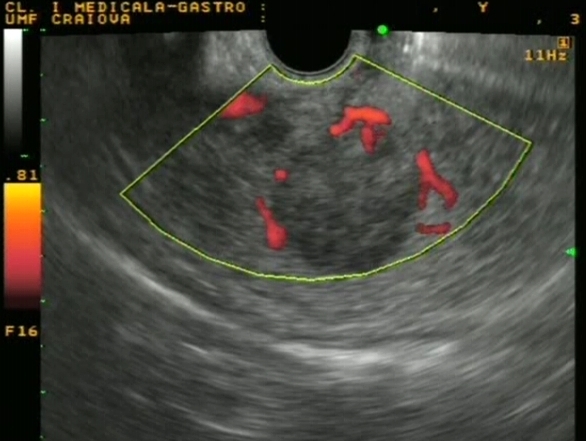 New EUS cases are added, courtesy of Prof. Dr. Peter Vilmann, Chief of Gastrointestinal Endoscopy Laboratory, Department of Gastrointestinal Surgery, Gentofte University Hospital and University of Copenhagen, DENMARK. Hypervascular tumor mass of the pancreatic tail visualized before and after contrast-enhancement (Sonovue 2.4 mL). The mass had predominant arterial signals inside, with a high pulsatility index. 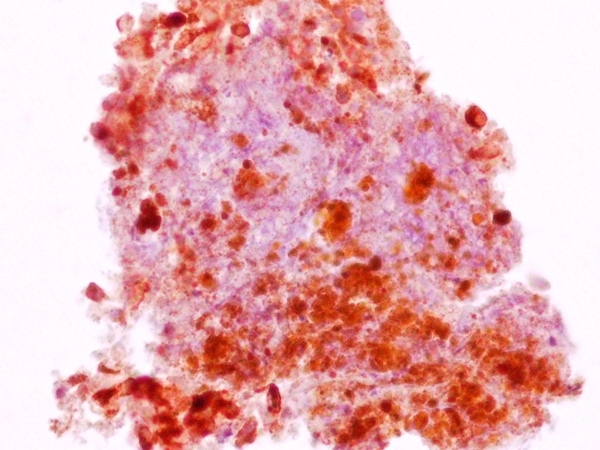 The diagnosis was confirmed by EUS-guided FNA with immunohistochemistry of the cell blocks. A 43-years-old woman, diagnosed 4 years ago with a malignant ocular melanoma, removed by surgery and further treated by combined chemo-radiotherapy. Transabdominal ultrasound and contrast-enhanced CT showed a 20 mm tumor in the neck of the pancreas. EUS showed peripheral signals in power Doppler mode (Fig. 1). EUS-FNA with immunocytochemistry showed an intense cytoplasmatic and nuclear immunostaining for S100 and an intense cytoplasmatic immunostaining for HMB45 (Fig. 2). 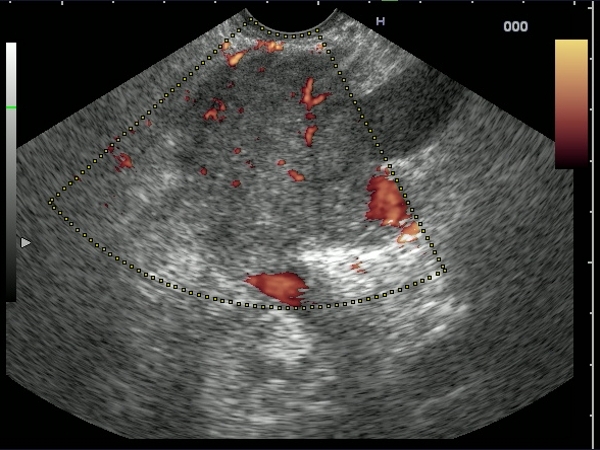 A 60-years-old male patient with chronic calcifying pancreatitis, with severe ductal obstruction and multiple communicating pancreatic pseudocysts. Two ERCPs failed to access the dilated pancreatic duct. 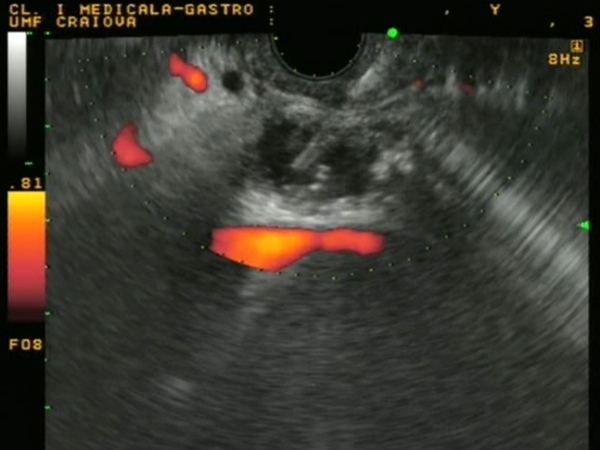 EUS-assisted rendez-vous procedure started with the EUS-guided transgastric placement of a 19G needle. After a guidewire was passed out of the papilla, the EUS-scope was exchanged for a duodenoscope, the wire grabbed and a pancreatic stent was inserted. Subsequent sphincterotomy and bile duct stenting was obtained. Pictures are best viewed using at least High (32 bit) color quality and 1024x768 pixels, with Netscape 6.0 or higher, and Internet Explorer 6.0 or higher. Movies are usually 30 seconds long, compressed with DivX 5.20 or above ( download ).